Vitamin C is just as important for solid oral health as it is for preventing colds and feeling good. In fact, one of the top causes of gum disease and bleeding gums is a lack of the vitamin. Let’s take a closer look at the many benefits of Vitamin C for children and adults — and then some ways you can get more in your diet naturally this month! Vitamin C works in a few key ways to improve the health of your oral and overall health. The vitamin encourages the production of collagen, the protein that’s vital to healthy cartilage, tendons, ligaments, skin and blood vessels. Additionally, it helps to heal wounds and maintain healthy bones. That’s a lot to take in — and what does it mean for your mouth? A lot, actually. Here are just a few of the ways Vitamin C contributes to excellent oral health. It’s estimated that 75 percent of American adults have gum disease to some extent — the condition which leads to chronic bad breath, missing teeth and other, more serious health conditions. Gum disease has actually been linked to diabetes, breast cancer and a host of heart issues. When bleeding gums, gingivitis or gum disease are present, upping Vitamin C can help to heal gum wounds for fresher breath and a healthier mouth. In addition to healing and preventing gum disease, vitamin C also strengthens the connective tissue that holds your teeth in your mouth. This is key for good gum health, too, as tooth loss is a major side effect of periodontal issues. Adequate Vitamin C consumption also contributes to improved bone health — something that’s important for the teeth and jawbone, too. Vitamin C helps the body produce plenty of collagen, which is also the main protein in bone. It’s not difficult to get more Vitamin C in your diet. It’s found in some of the most delicious fruits — and with summer coming up, there’s never been a better time to decide to add more of the vitamin to your plate! The best sources of vitamin C are found in whole fruits, which contain less sugar than fruit juices. Below are some high-vitamin C fruits and vegetables. 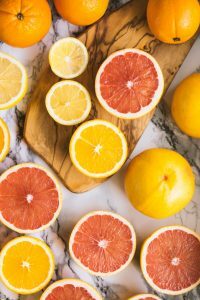 Because too much citrus can damage tooth enamel, rinsing your mouth after eating oranges, tangerines and pineapple will help you enjoy the benefits of Vitamin C without weakening enamel. If you have questions about the link between Vitamin C and your gum health, or if you need gum disease treatment, please don’t hesitate to contact the Dental Center of Westport team!